Adult painting sessions for intermediate, advanced and beginner levels. Artists work from reference photos (yours or supplied – primarily landscape or still life). Regular painting demonstrations and the instructor painting along allows for total freedom to explore the medium and help when needed. 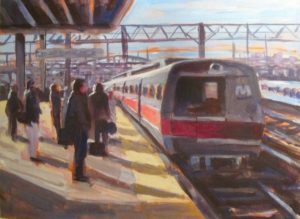 Each artist receives individual attention working at their own pace and within their own abilities to develop confidence with better techniques of drawing, composition and color theory. Paintings are developed to a finished stage, working with final values to make them cohesive and dynamic. All teaching is done with a positive approach and an understanding of the artist’s personal desires through interaction and discussion. The goal of these sessions is to enjoy the painting experience. Acrylic is the perfect step from watercolor into an opaque, solid medium. A list of basic supplies will be sent to interested artists. Dates: Fridays: 5/3, 5/10, 5/17, 5/31, 6/7. Makeup 6/14. Teaching Artist Jay Babina is a painter with over 40 years experience, as well as, a practicing graphic designer and illustrator. He works in watercolor, acrylic and oil, and various drawing mediums. He paints both en plein air and in-studio works, approaching art with passion and enthusiasm. Jay is a graduate of The Silvermine College of Art and University of Bridgeport where he studied graphic design. He has shown at numerous galleries in the east and is involved with many art societies throughout CT.